"June has traditionally been the most popular month for weddings for centuries around the world. That is where the term "June bride" comes from. Historically, there are several reasons for that. The month of June derives its name from Juno, the Roman goddess of marriage. In ancient times it was thought that couples who married in June would be blessed with prosperity and happiness. There were also many logistical reasons for brides to consider June weddings. Brides married in June were likely to give birth to a first child in spring (also thought to bring good luck) and recover in time for the fall harvest. During medieval times a person's annual bath usually fell in May or June, meaning that June brides still smelled relatively fresh. In modern times those things are not so important, but weddings still take place in June more than any other month. It’s the month that summer begins (northern hemisphere), the flowers are all in bloom and the weather is warm without being too hot. So for this month’s challenge, channel your inner bride to create the perfect wedding accessory for a June Bride. Perhaps a decorative barrette for her hair, a cuff to set off her new wedding ring, a beaded sash for her dress or the quintessential necklace full of luster and sparkle. There’s nothing as stunning as a Bride decked out in white, but also think about the red silks of a Chinese Bride, the Henna Mehndi of the Indian Bride, or the bright colors of the Moroccan Bride. " 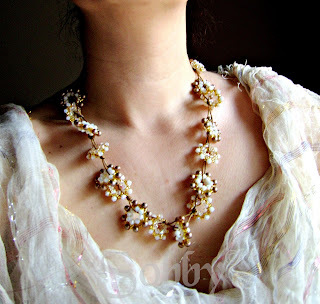 I just made a bunch of donuts and knotted them together with waxed cotton thread, like in my Cherry blossom necklace. Maybe it's just I don't like stiff, traditional weddings and love those relaxed ceremonies where everybody feels comfortable and actually has fun! I'm not really a wedding girl, if you hadn't got it, but I certainly appreciate the beauty and fascination of a bride as anybody else. As usual you can vote for your favorite entry fron the 9th to 15th of June on our team blog. I think it's very elegant. Nice! Lovely. Nice that it is not only white, too. Lovely texture.